Malic acid — a component of almost all fruits — is commonly used as a food additive and preservative. 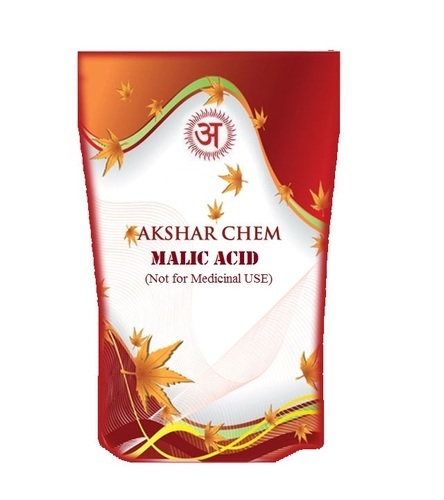 Akshar Exim Company Private Limited is a prominent trader and supplier of an extensive range of Industrial Chemicals, which is established in the year 2010. In our product range, we offer Gypsum Powder, Talcum Powder, Soda Ash, Barytes Powder, Melamine Powder and Sodium Alumina Powder. Furthermore, we offer Sodium Gluconate, Activated Alumina, Sodium Silico Fluoride, Silica Gel, Magnesium Chloride, Industrial Minerals, Feldspar, Gel Packs, Industrial Chemicals and Hydrofluoric Acid. To cater to the ever growing demands of clients, we also provide them with quality-approved sodium aluminate powder and hydrofluoric acid 30 percent, among others. These products are widely demanded in the market for quality attributes such as longer shelf life, balanced chemical composition and purity. Gypsum powder that we bring forth for our valuable clients is known for its ability to strengthen material or increase viscosity of a substance. Owing to optimum quality standards of this powder, this is widely used in cooking, fertilizer, drywall, cement, plaster, paint and others. We have a team of chemical engineers and allied experts who make us capable of timely providing our clients with premium quality industrial chemicals. These chemical products are procured only from some of the most reputed manufacturers of the industry. We are leading exporter of Stone & Industrial Chemicals in Eastern India mainly Kolkata, Bihar, Jharkhand, Orissa, Assam, Siliguri, Durgapur, Asansol, Ranchi, Dhanbad & Bhutan region.